Sixteen-year-old Mara Westray has just lost her mother, and now, being shipped off to live with the father she doesn't know is not how she imagined grieving. She's already counting down the days until she turns eighteen and can leave the tiny island of Swans Landing. But from the moment she steps off the ferry, nothing is as ordinary as it looks. Whispers of a haunting song on the wind make her see impossible things, and she isn't sure she can trust her judgment about what is real and what isn't anymore. Maybe she can't even trust her judgment about quiet Josh Canavan, whose way of speaking in riddles and half-truths only confuses her more, luring her deeper into the secrets hidden beneath the ocean's surface. SURFACING is an approximately 78,000 word/314 page young adult paranormal romance, and is the first book in the Swans Landing series. 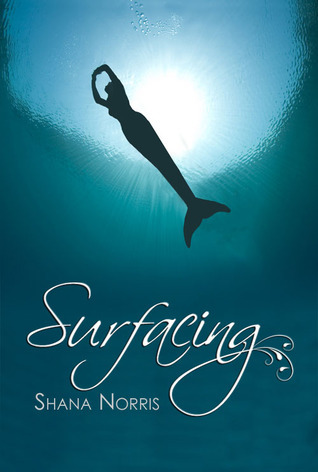 I decided to start reading Surfacing, because I’m on this mermaid high right now…and the story sounded pretty good. Honestly, that’s exactly sums up the book itself. Its…pretty good. The story was cute, some sadness, some angst…but overall was a little too unrealistic. Not the mermaid part, just the part that the humans hate the mermaids so much that they openly harass them, but not enough to out them to the rest of the world?? Mara was mostly likeable—except for how she handled the two-boys-want-me thing…a dishonest person is an unlikable one in my book. Still, it was an enjoyable, quick read. I enjoyed the tiny burst of romance. And the lore of the finfolk. The writing was great, and I do believe I’ll be reading more from this author in the future. *Thanks to Netgalley for providing me a free copy in exchange for an honest review.